What a nice surprise! I just emailed the folks at Pact to let them know I added them to the "Buycotts and Boycotts" section of this blog—as a buycott, since I love their underwear as well as their commitment to nonprofit groups and sustainable packaging. And CEO Jason Kibbey wrote back to say that Wallet Mouth readers can get 20% off by using coupon code wm20. This is the first time I've ever been in a position to offer a coupon, so it feels a little weird, but seriously, if you need some knickers, go nuts. Pact is the most eco-friendly underwear maker I've heard of, and I can personally attest to the quality of its products. I saw an ad for bottled water recently that caught my eye: For every liter of Volvic that you buy, the sign said, the company will provide 10 liters of clean drinking water to Ethiopian children through a partnership with UNICEF. Immediately a red flag went up in my brain. It may be laudable for a corporation to fund new sustainable water supplies and sanitation education programs in an area of the world where such things are sorely needed. However, it's hard to get around how troubling the bottled-water industry as a whole is. As Annie Leonard's just-released "The Story of Bottled Water" makes clear, agua that doesn't come from the tap is problematic along its entire life cycle, from the oil required to make its bottles to the pollution it causes once it's tossed. It is not necessarily as pure as tap water, which in the developed world is regularly inspected and well regulated (violations of the Clean Water Act notwithstanding), and it costs thousands of times more. Another video, by Food & Water Watch, emphasizes how bottled-water companies siphon off what most of us think of as a public resource, straining the environment in the process. That is perhaps the most troubling aspect of the issue to me: the privatization of municipal water supplies. And as Mother Nature Network points out, the more people get accustomed to consuming bottled water, the more distanced they become from the tap and the less incentive they have to support bonds that would maintain and upgrade public systems. So getting back to Volvic's campaign, if for some reason I got marooned on an island with no freshwater source and only two water vending machines, one for a company with a do-gooder campaign and one without, I would give my money to the former. Then I'd start sending smoke signals in hopes that the Plastiki would pick me up. But really, if helping kids in Ethiopia is the objective, I'd rather just contribute directly to a nonprofit like Charity: Water. Creative Commons-licensed photo by Flickr user @kevinv033. ... and by "greenies," I mean green consumers, not leprechauns. That's what two assistant professors at the University of Toronto suggest based on their experiments with students. I'm not so sure. You can read the details in this post from Green Inc., but here's the gist: a group of students instructed in one phase of an experiment to purchase goods from an eco-themed website was less likely to be generous and more likely to cheat and steal in subsequent phases than a second group of students told to shop on a conventional online store. Meanwhile, students who were asked merely to rate green products were more generous than their conventional counterparts. To summarize the Canadian researchers' conclusions, being exposed to green products makes you more altruistic, but actually putting your money where your mouth is may turn you into a stingy pilferer. Or, as the Guardian put it, "People who wear ... the 'halo of green consumerism' are less likely to be kind to others, and more likely to cheat and steal." My first reaction to this story was, I don't buy it. For one thing, the subjects in the experiment who bought green products didn't necessarily identify as ethical consumers; they were simply students told to buy stuff from a green website. How about some data on "real" socially conscious shoppers—including non-student ones? However, maybe leaving self-identified greenies out of the experiment was part of its point. After all, "green-ness" is a continuum, and hard-core conscious consumers—people who have embraced environmentalism on numerous levels of their lives—still represent a minority of all shoppers. Given that, it's useful to see how "average" consumers behave when confronted with the multitude of eco-friendlier products currently bombarding the marketplace. Also, I have to admit that the researchers' contention that "virtuous acts can license subsequent asocial and unethical behaviours" (quoted in the Guardian)—so-called moral balancing or compensatory ethics—does ring true to me. But that doesn't mean our new strategy to save the world is to stop buying from companies that do the right thing. In the meantime, I'm off to go pick some pockets! Not that anyone's about to curl up in an armchair and read this thing cover to cover, but pages 37 through 44 of the U.S. Department of Labor's recently issued report on child labor and forced labor could make for some interesting browsing. That's the product-by-product list of which countries use which of the two types of labor. Change.org (which pointed me to the report) highlights some of the worst offenders here, and notes the need for more analysis. To whit, what specific companies source problematic goods and sell them in the U.S.? Carrot Mob event in San Francisco tomorrow! To all my Bay Area readers: Want to do something fun and social that will also make you feel good about harnessing your economic power? Tomorrow, Sept. 10, 2009, from 5 to 10 p.m., the pocketbook activists at Carrot Mob invite anyone and everyone to show up at Epicenter Café, at 764 Harrison between Third and Fourth streets in SOMA, and spend some money there as part of a group effort to help the café earn some extra bucks to improve its already quite laudable green credentials. More details can be found here. I'm going to try to make it on the early side with Mini Mouth. Maybe see you there! Perhaps I should have read Joel Makower's post on Wal-Mart's new green labeling system before blogging about it last week, as he knows far more about it than the Wall Street Journal does, having seen early versions of it and talked to many parties involved with the effort. The two big letdowns for me are (1) that the labels will address only product manufacturers, not specific products, and (2) that Wal-Mart isn't actually rating anyone (companies or products), because it hasn't set any performance benchmarks. Which is not to say that the whole thing is crap, but... You can read his post in full here. Last month I blogged about Carrot Mob, a newish consumer-based movement in which businesses are given the incentive to improve their sustainability record. It had been a while since the last San Francisco event, but I'm happy to report that a new one is in the works. And this time, we the mob get to help determine which of three cafés will earn our business on the appointed day. I definitely plan to get my caffeine buzz on at the winning establishment. Check out the options here, and vote—today's the last day. a shot in the arm? Wal-Mart! The company says it will take about five years to construct the ratings system and distill all the information from companies into a format consumers will find useful. I've talked to many individuals who have had this idea and even taken a stab at it (but are often stymied by a lack of financial resources). A multitude of certifications and eco-labels exist, and there are companies such as Patagonia that have come up with their own labels, but this is by far the largest effort in the green labeling arena that I've heard of, and it has the potential to set the template for how future such labels emerge, at least in the U.S. The devil will be in the details, of course. Standards makers are the new diplomats in today's globalized world. How trustworthy will the data be? Will there be an auditing process to ensure that suppliers are honest? I will be watching this development with great interest! Virtue may be its own reward, but it often comes with a hefty price tag. This is true not only for individuals—witness, for example, the comparatively high price of organic vs. conventional produce—but also for businesses. Companies interested in making themselves more responsible rarely have the economic incentive to do so, especially in today's belt-tightening climate. In fact, more often than not, they have an incentive not to engage in practices that are better for people and the environment. A new approach to consumer activism is out to change all that. It's called Carrotmob. A for-profit (though not-yet-profitable) project of San Francisco–based Virgance, Carrotmob aligns opposing economic incentives like a good mash-up makes disparate pop songs hook up. How? By getting competing companies to list the green improvements they'd be willing to make to their business if they received a significant infusion of cash, and then getting consumers to band together on a given day and make coordinated purchases at the business with the strongest offer—thereby funding its commitment. At the first Carrotmob event, which took place last year in San Francisco (and which I, flailing about in the haze of new parenthood, unfortunately missed), a convenience store called K&D Market was inundated with hundreds of customers who lined up outside for the chance to spend money there. In a few hours, the shop raked in more than three times what it normally makes on a good day. Consequently, it was able to lower its carbon footprint by replacing its lighting system with a more energy-efficient one and making improvements to its refrigerators. Since then, Carrotmob events either have taken place or are being planned in 21 other cities, 16 of them in the U.S. Any readers out there in Portland, Oregon? Help a local business get more energy-efficient by eating some pizza this Sunday. As someone who's obsessed with the notion of helping consumers align their values with their spending habits, I love the concept of Carrotmob. I especially love the fact that it's reward-based rather than punitive. I mean, boycotts are all well and good, but buycotts are more fun—and, it seems, potentially more powerful. Carrotmob is basically a mass buycott on steroids. I can see only a couple of possible downsides. One occurred to me as I watched the video of the San Francisco event (see it here). I couldn't help but wonder: Say I'm at a convenience-store-type Carrotmob; how many of the products on those shelves are made by companies I really want to support? Especially if I'm at the end of the line and there's not much left to buy. I spotted in the video a lot of little packages of junk food, as well as toilet paper that for all I know is made from virgin-forest pulp. Also, for an establishment to attract a good mob, it's got to have mass appeal. So too bad, little vegan shoe boutique, I don't think you're ever going to get a Carrotmob. But perhaps I split hairs. Mainly I'm happy Carrotmob exists, I look forward to the next event I can participate in, and I'm curious to see how much momentum this movement gains. Where to buy ethical office supplies? 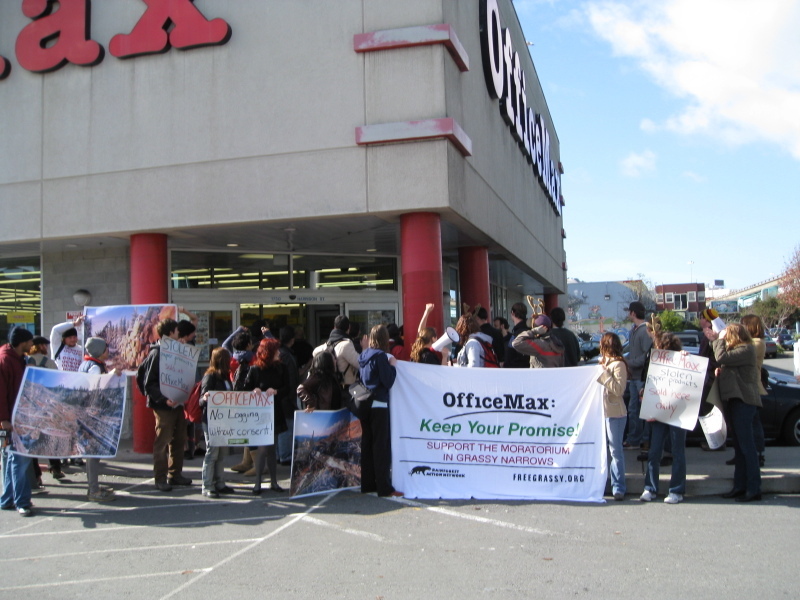 Today’s OfficeMax action was great fun, a spirited but peaceful protest with a healthy turnout of about 35 activists. I got to don a pair of fuzzy antlers and talk to several customers who appreciated learning that much of the paper sold by the office-supply giant harms indigenous people and old-growth boreal forests in Canada. But after writing yesterday’s post plugging the protest, I realized that I had a problem: I’m running out of paper and envelopes for my home office, and I don’t know where to replenish them. I used to go to Office Depot, because you could get a free ream of recycled paper (though it turns out it was only 30 percent recycled) in exchange for turning in a used printer cartridge for recycling. That served me well for a long time, but the deal is no longer offered; now you just get a discount. According to this “report card” published by Forest Ethics and Dogwood Alliance last year, the best option is Staples. It earned a B (beating Office Depot’s C+ and OfficeMax’s D) for offering paper products with an average of 30 percent post-consumer recycled content and for committing to have the majority of its paper products be certified by the Forest Stewardship Council (FSC) by 2010. Again, though, only 30 percent recycled content? Surely we can do better than that. Also, I’d rather avoid big-box stores. But independent office-supply shops are few and far between. San Francisco has one that I know of—family-owned Patrick & Company—but the hours are limited, and the best it offers on the recycled-paper front is... you guessed it, 30 percent. One of my fellow protesters mentioned New Leaf Paper, an environmentally friendly brand that can be found at Office Depot and FedEx/Kinko’s. And after poking around online for a while, I found what looks to be a great resource: online retailer the Green Office (which happens to be located in San Francisco). It sells several kinds of 100 percent post-consumer recycled content paper, plus all sorts of other business products (including toner, fax machines, and janitorial and break-room supplies). The company even offers sustainability consulting services. Especially cool is its system of logos that give shoppers quick visual cues about different sustainability aspects for each product. For example, a cheerful icon featuring a yellow badge tells me that this Strathmore stationery has three third-party certifications behind it: the FSC, Green Seal, and the EPA’s procurement guidelines (the latter isn’t actually a certification system, but I get where Green Office is coming from).